The number one mantra in real estate is “location, location, location.” In the Dove Mountain community, the location provides quality of life for families, young professionals and retirees. This luxury resort community, at the foothills of the Tortolita Mountains, is just 25 minutes north of downtown Tucson. There are 2,000+ acres of natural desert open space within the community and even more surrounding its perimeter for outdoor enthusiasts to enjoy. Footsteps from fitness – If you are seeking a location to call home that promotes an active lifestyle, you can boost your health and have fun doing it in Dove Mountain. Hiking – Dove Mountain connects to more than 50 miles of trails traversing through the breathtaking Sonoran Desert. Some of the finest hiking trails in the region begin in Dove Mountain, including the Alamo Springs, Javelina, Ridgeline, Wild Burro, and Wild Mustang trails with elevation gains of 2,000+ feet and looping connections for endless variety. Unique to Tucson, all of the hiking trails in Dove Mountain are pet friendly. 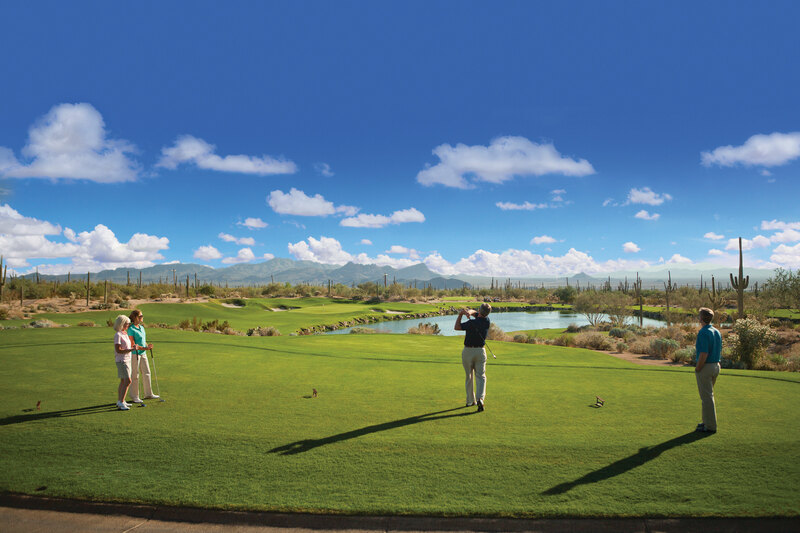 Golfing – Dove Mountain boasts 81 immaculate golf holes across three spectacular and unique golf clubs including the Golf Club at Dove Mountain, home of the World Golf Championships Accenture Match Play. Mountain Biking & Cycling – Trails connect throughout the community and surrounding Tortolita Mountains for incredible mountain biking experiences. Additionally, Dove Mountain residents can access the 124-mile Huckleberry Loop via new bike lanes on Tangerine Road, connecting riders to parks, restaurants, shopping areas, major employers and more. Dogs Are Welcome – Dove Mountain features well-maintained dog parks and walking trails that meander through neighborhood green spaces, or down to the local coffee shop and restaurants, all pet friendly. The Gallery Sports Club – Many Dove Mountain residents enjoy membership at The Gallery Sports Club with its beautiful swimming pool, tennis and pickle ball courts, fitness equipment, classes and a spa. To learn more about all that the Dove Mountain community has to offer, including custom homes, homesites and current and upcoming listings, contact Dove Mountain Properties toll free at 888-603-7600 or contact us.